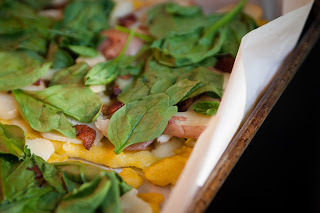 Bella put together gluten-free pizza for the family* yesterday, by making a polenta crust for the base, then loading it with potato slices, chopped bacon, sauteed leeks, Gruyere cheese, and a last topping of spinach. Polenta is a great solution to the conundrum of gluten-free crust. I can't get excited about the flour substitutions that go into GF "bread", but polenta is its own thing, and that's the way I almost always want to go. *The Composer is temporarily GF, and my visiting mother is permanently GF. The rest of us eat whatever. Of course Bella's pizza looks magnificent!! Thanks for posting the link to the crust recipe. I should really avoid gluten more than I do, but I think finding delicious and simple alternatives is the key. I can't wait to try this one. And I'm certain if your discerning family enjoy it we will too. How about that! I'm trying to reduce my wheat intake. This is how I make our pizzas, too! 50% of family members are gluten-free, and although I consider myself a fairly skilled gluten-free baker, I do avoid the yeasted breads. I just don't think you can replicate that so well, and I'd rather have something altogether different than a sad attempt at replicating The Real Deal! Most gluten-free store-bought crusts are not edible! Looks quite delicious! I am trying to go gluten free, but it is difficult and expensive! I don't care for the off taste of the bean flours, but the rice flours are quite good. We'll have to try this one. My eldest was diagnosed with cealiacs last year and it's been quite a learning curve. I agree about the bread - it's really tough finding a good substitute. This looks fantastic- thanks for sharing! My parents, grandparents and I all eat a vegan diet (Mom's lost 20 lbs in 2 months, and Dad's blood pressure is so low he's almost off his meds and can't wait to eat grapefruit again). In November, I identified a gluten sensitivity and will be undergoing celiac testing in the near future. It's great to have a pizza crust recipe, and I can easily make vegan pizzas when the family comes over to visit now! What a great idea. Might be a good solution for my coeliac brother.